For some time, increasing importance is attached to services, both from an economical and a managerial perspective. First, the notion of “service as basic unit of exchange” emphasizes the application of specialized competencies for the benefit of someone else, while disregarding if a physical good or any other resource is used for exchanging value. Second, service-orientation allows enterprises to enter new markets by extending their existing portfolio of products by related services or realizing entire new offerings that are enabled by recent advances in information technology. Service description is a key challenge in developing and providing services to and with customers. Further it is a premise for coordinating several providers of an integrated customer solution. 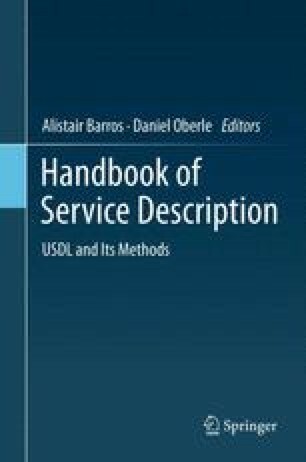 This chapter is an effort to explain how conceptual modeling can facilitate service description. We use Product-Service Systems (PSS) as an exemplary domain.We extract central concepts from several disciplines that are engaged in researching business aspects of PSS to develop a catalogue of modeling requirements to be accounted for in service description. Consecutively, these requirements are utilized to assess the current state of conceptual modeling languages for (product-related) service description. The review leads to the identification of further prospects to be accounted for by service description.